By Jay Rogers. Posted May 29, 2018. Epiphanius of Salamis (c. AD 320 to 403) was a bishop of Salamis, Cyprus. He gained a reputation as a strong defender of orthodoxy. 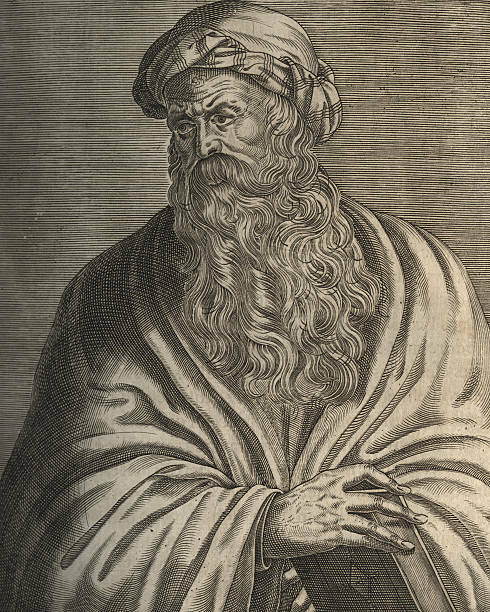 He is best known for composing the Panarion, a very large compendium of the heresies up to his own time, full of quotations that are often the only surviving fragments of these texts. He was also an early critic against contemporary uses of iconography in the Church. I post this for those who are interested in Full Preterism (Hyper-Preterism). Some of my Full Preterist acquaintances have objected that Hymenaeanism refers only to the teaching that the “resurrection is past” around the time of Paul’s writing of his two Epistles to Timothy in the early to mid-AD 60s. They insist this cannot refer to the resurrection of the saints or the Second Coming of Jesus in AD 70 – which is when many Full Preterists claim these events occurred. Since Paul was writing prior to AD 70, they claim this heresy cannot apply to today’s Full Preterists who say the Second Coming and Resurrection occurred in the past. On the contrary, in Panarion, Epiphanius provides some useful information on how the early Church viewed the Hymenaean heresy as a form of Docetic Gnosticism. The Docetic sect embraced pseudo-spirituality, denying anything good in the material world and held that Christ only appeared to have a real birth, death and resurrection. Full Preterists are repeating elements of this Docetic Gnostic error – at least in the way that Epiphanius recorded the points of Hymenaeanism. In his second epistle, moreover, he says that Hymenaeus and Philetus have gone wrong about the truth. They were followers of this sect themselves, proclaiming another God and endless genealogies, implanting fresh error in men by saying that the world was not made by God but by principalities and authorities, and that the resurrection has already come in the children who are begotten by each of their parents, but that there will be no resurrection of the dead. And see the character of the truth, brothers, and the refutation of their disorder! (Epiphanius of Salamis, Panarion 8.1-6). Note the following points in Epiphaius’ summary. Jesus was bodily raised from the dead. Although this was His glorified body, He was not a ghost or an apparition. Likewise, the future bodily resurrection of the dead is undeniable (1 Corinthians 10:12-58). Proto-Gnostics, such as Phygelus and Hermogenes, apparently taught that the souls of the departed need to ascend through a series of Aeons giving a defense of their works and faith before each authority. Followers of this sect have thus departed from the Church as heretics. They have departed from the true Gospel that teaches that the souls of the dead need only the finished work of grace, which was “sustained by” (or affirmed by) their good works and faith (James 2:14-26). Hymenaeus and Philetus were also part of this Proto-Gnostic sect. They taught “endless genealogies” (1 Timothy 1:4) meaning this chain of authority made up of “lesser gods,” or Aeons, that ascend in the spiritual realm. Like the later Gnostics, Hymenaeus and Philetus proclaimed another God who was the Father of many lesser gods, and that the world itself being evil matter was not created by God, but instead by these principalities and authorities. The Hymenaeans taught that the resurrection of the dead was a past event and that children born of believing parents have received this spiritual resurrection. There will therefore be no future bodily resurrection of the dead. Jesus’ resurrection from the dead was a bodily resurrection and so too the resurrection of the righteous dead “will be” a bodily resurrection in the future. The Hymanaean heresy is linked to the Gnostic denial that Jesus had a physical body and that His resurrection was spiritual only. Epiphanius also links the Hymenaean error to the contemporary Gnostic error that said the world was created not by God, but through a chain of Being – with numerous Aeons – or “principalities and authorities” who made the evil material world. Similarly, many modern Full Preterists deny a literal six-day Creation, but God worked through the stages of evolution over numerous ages. They also deny that physical death came into the world through Adam’s sin, but death existed as part of the natural order for millions of years. We believe in one God, the Father Almighty, Maker of heaven and earth, and of all things visible and invisible. And in one Lord Jesus Christ, the only-begotten Son of God, begotten of the Father before all worlds (aeons), Light of Light, very God of very God, begotten, not made, being of one substance with the Father; by whom all things were made; both in heaven and on earth. Since the Gnostics taught a spiritual resurrection of Jesus and thus a denial of a bodily Second Coming of Jesus and a denial of a future bodily resurrection of the saints, they in reality believed the world would continue in a state of death and decay until it was destroyed. There will be no New Heavens and New Earth because that too exists in the spiritual realm only. So we can see that ideas have consequences. Modern Full Preterists commit a heresy very similar to the ancient Hymenaeans. The “New Heavens and the New Earth” (which many moderate preterists, such as me, agree now exists as a spiritual reality) will never become a physical reality in their scheme. On the contrary, the Word of God teaches that death itself, the last enemy of God, will one day be defeated (1 Corinthians 15:24-26). -» Peter Hammond – Puritan Storm Rising!